Well it’s been a while since I’ve written anything on this blog. Almost 6 months, 11th of July was the last post I did. Changes were happening in my life and I just wasn’t in the mood for writing. The biggest change has been that Andy and I are no longer together. We have been living separately since last August. We are still good friends and look out for each other, we even spent Christmas together. After 20 years together I suppose we had both changed and living together wasn’t as free and easy as it once was. Of course many of you will have been through the same thing and know that life goes on. There is always that period of adjustment though. Naturally! Uncoupling isn’t an easy thing to do. I am still living in the cottage and Andy is living in a rented cottage which is about 20 minutes drive from here. We see each other every week and I’m glad to say there is no bitterness between us. He still cuts the wood and other jobs around the place. I enter 2015 on calm waters and look forward to the year ahead. Who knows what it may bring! 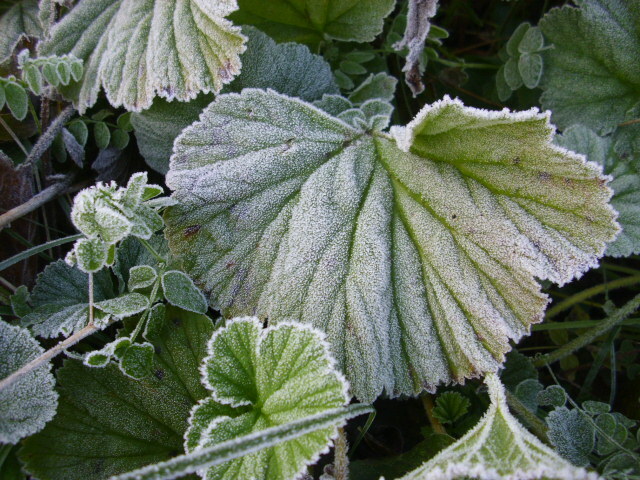 I am looking forward to working in the garden again, not that I ever stopped! Snowdrops are already visible and of course everything is stirring back to life beneath the surface of the Earth. 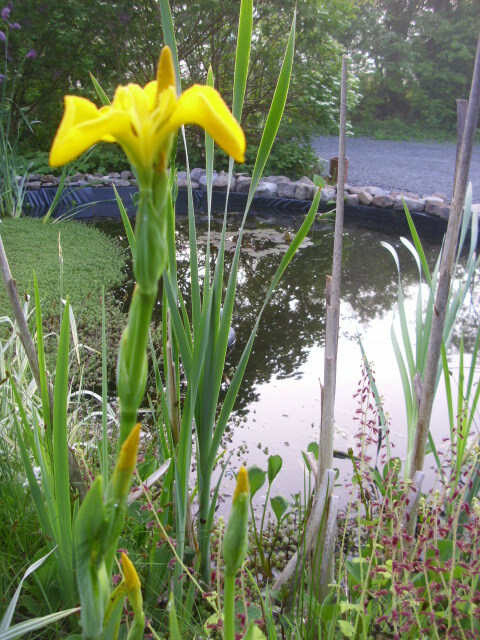 So looking forward to the Spring flowers. Especially the Daffodils, I just love them. I always feel relieved when the shortest day is over. I imagine the evenings are already a bit brighter. 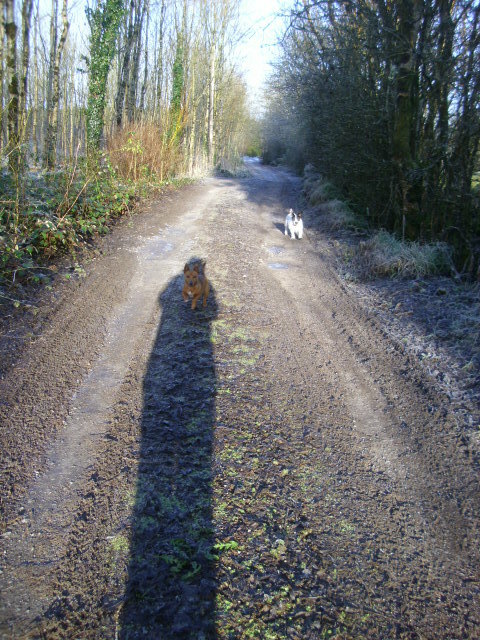 The days of long shadows are nearly over as the Sun once again rises higher in the sky. Before I finish I would like to thank all the people who sent me messages in the past months wondering if I was ok. Sorry for not replying but that was the space I was in. It was so nice to know that there are so many genuine and caring people following this blog. Much love and good wishes for a happy 2015 to you all! Just a month to Christmas and the Winter Solstice and the weather is just amazing. 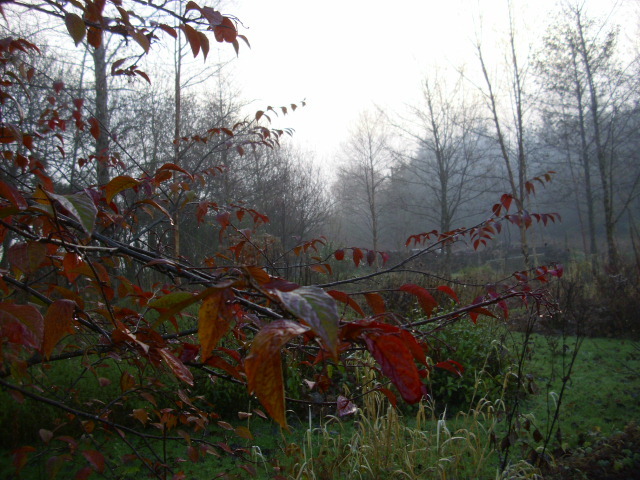 The misty mornings open out to nice mild days…ideal for working out of doors. It gets cold and dark early but then it is meant to be Winter! 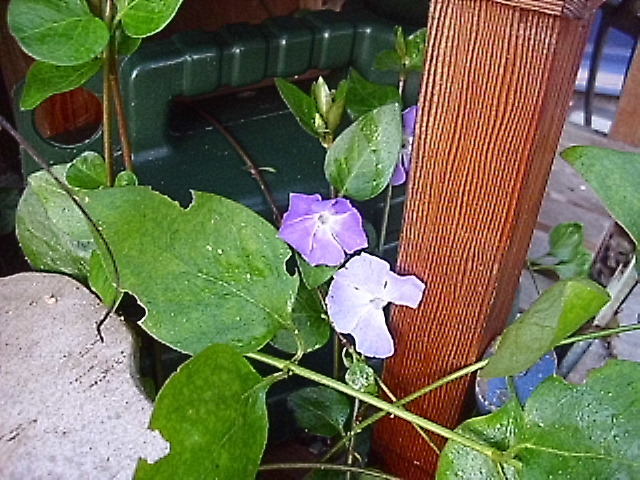 Periwinkle is still blooming in sheltered spots. 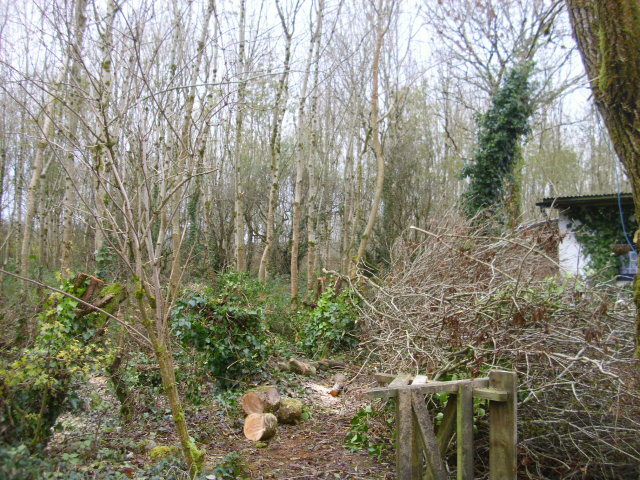 We have been busy with various outdoor jobs. 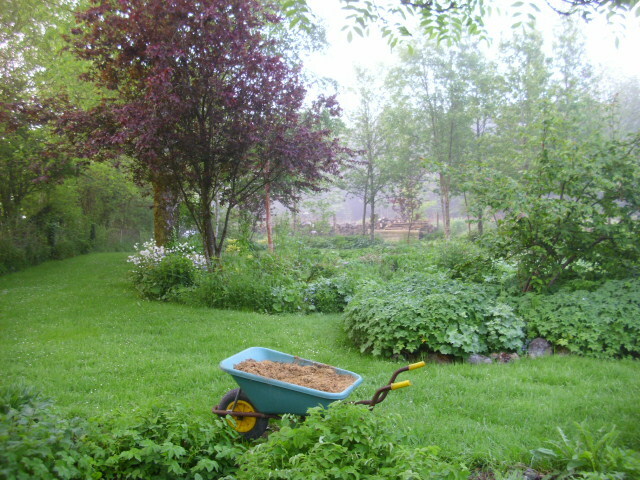 Mulching to clear the beds for planting anew next Spring is ongoing. 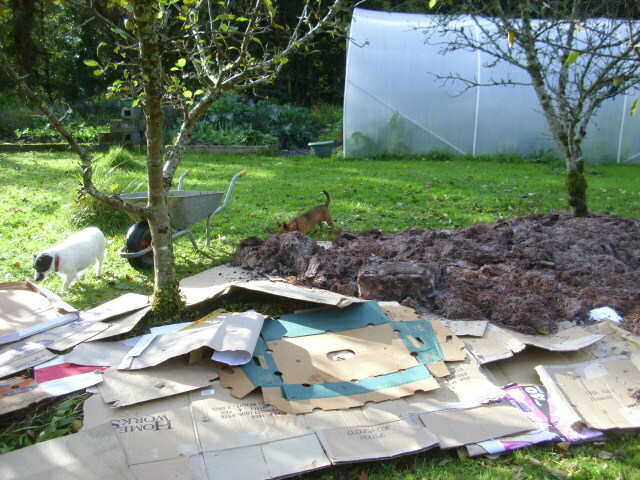 Lots of cardboard covered with ample amounts of mushroom compost should clear the ground nicely. 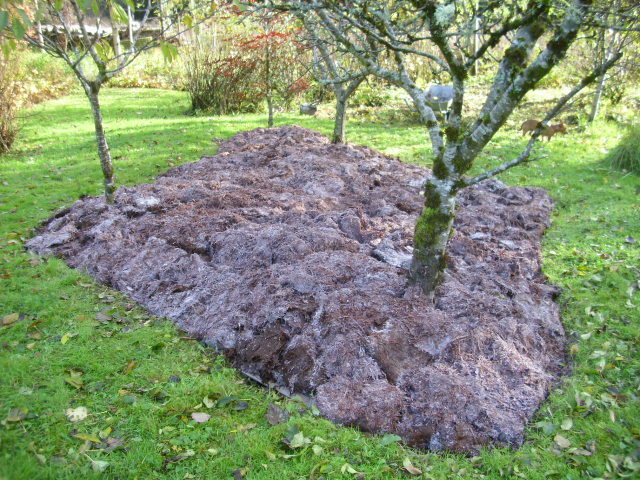 This might seem like a very thick mulch but the compost settles a lot. 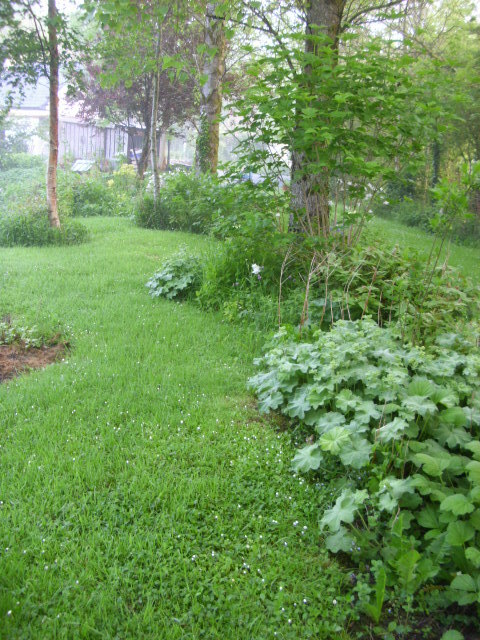 By Spring this will be ideal for planting into…nice black heat retaining compost…hopefully weed excluding too! 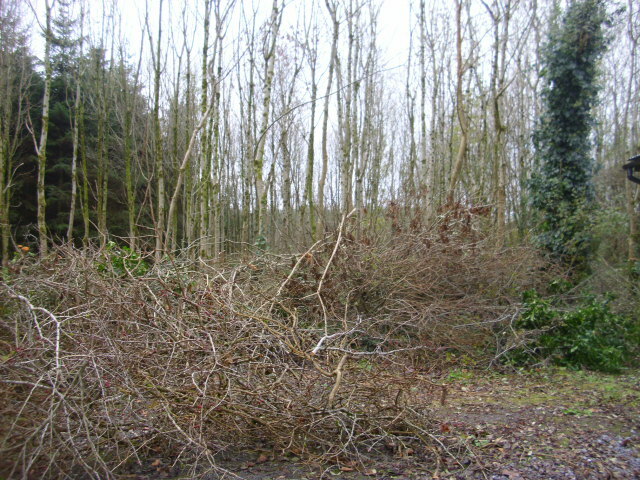 Andy has been busy coppicing the boundary hedges. They had’nt been cut for years so were long and gangly and bare at the bottom. 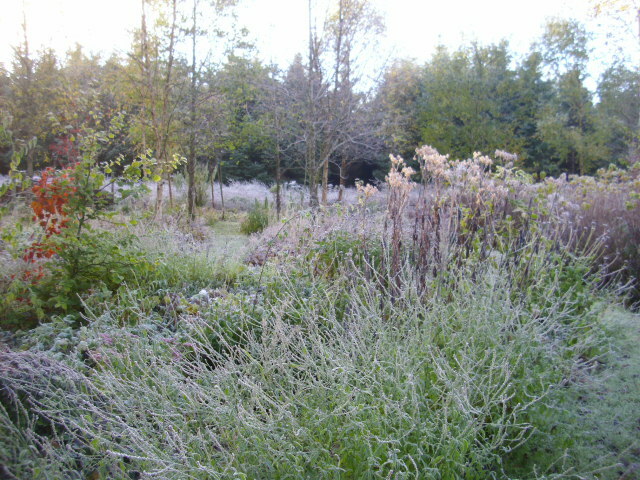 We will interplant with more plants to make a good thick hedge here. The lower height allows us to borrow from the landscape of the Ash forest behind. 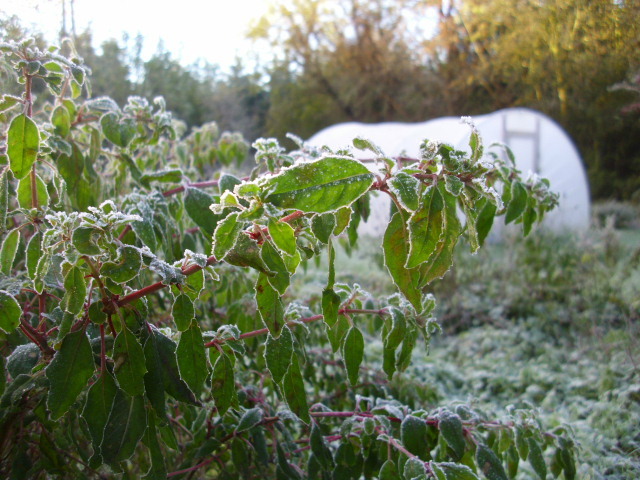 All the plants in the hedgerow are Ash and Hawthorn…both suitable for burning green. They both burn very hot too. 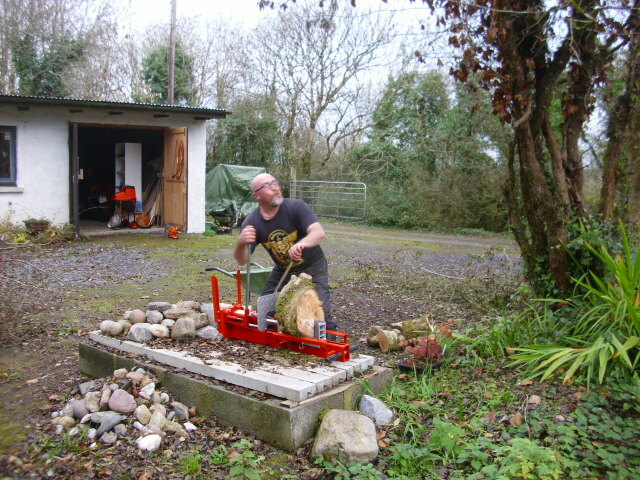 Andy has been chopping it all into fire sized logs on his new log splitter. He insists on making those funny faces…beyond my control!! In the shed behind you can see the new shredder. This will be used to turn this lot into mulch for beds and for making pathways. There’s still about another hundred feet of hedging to be done so lots to keep us busy for some time. 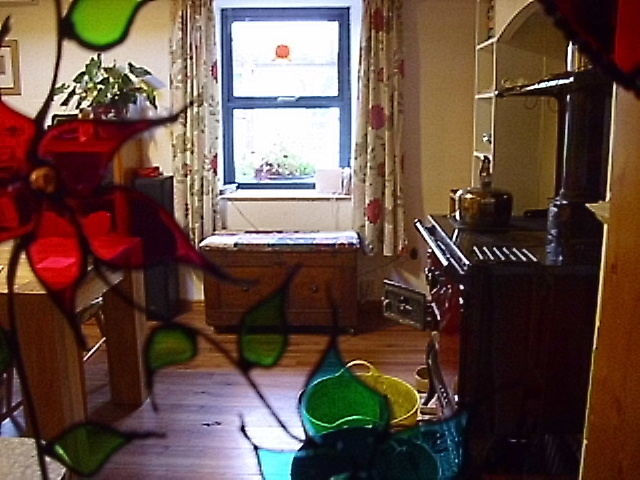 After a day’s work it’s nice to retreat to the cosiness of the kitchen where the stove is kept ticking over all day. The kettle is always full and on the point of boiling for cuppas for ourselves and anyone who may drop in. Visitors are always a good excuse to retreat into the warmth of the house. Looking forward to many more of these Spring like Winter days…they may make for a very short Winter. Fingers crossed! 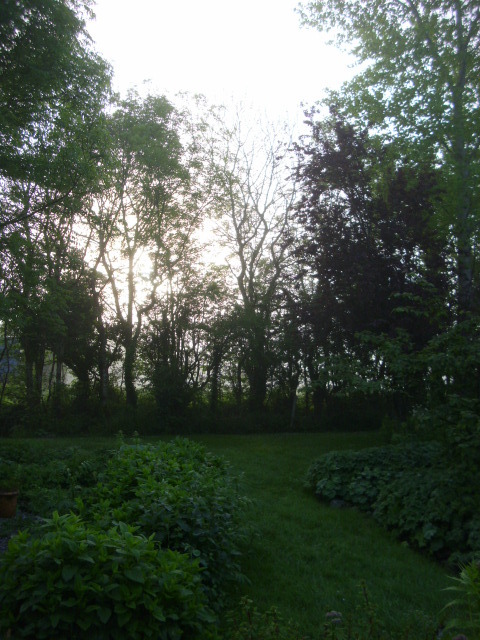 Early morning in an Irish country garden. It is early morning…6.3o to be precise…a bit earlier than usual for me to be up and about but I didn’t sleep very well. Probably due to being on antibiotics and steroids for an upper respiratory tract infection. Hopefully the drugs will do the trick and in a few days I shall be tickety boo again. and the Newts are up and about. 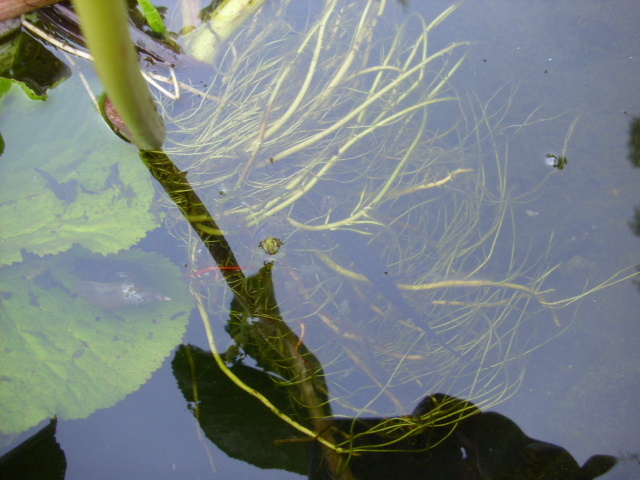 Must be hundreds of Newts in the pond. I wonder if Newts ever sleep? 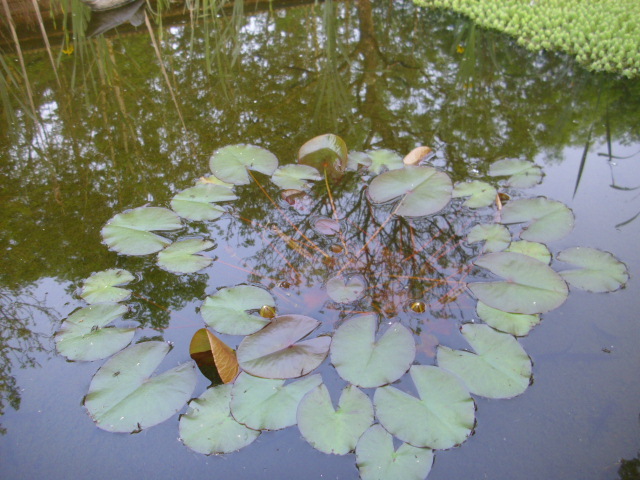 I can see little flower buds on the Water Lily. Everything feels so alive and vibrant. The growth is so strong that the scene changes from one day to the next. A privilege to be able to observe it…I am thankful. 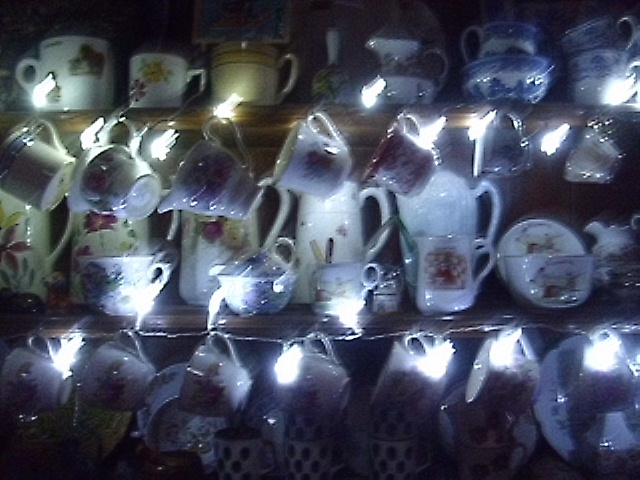 As the Sun starts to emerge it is time to go indoors and get the kettle on for coffee. So calm and white and bright. until the reemergence next Spring. 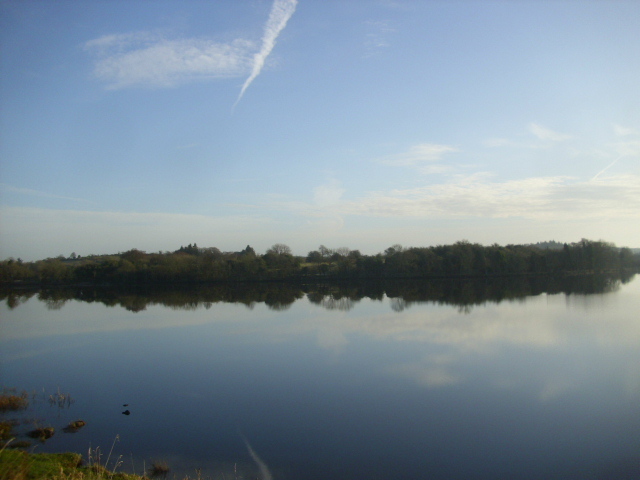 So still and calm this morning. 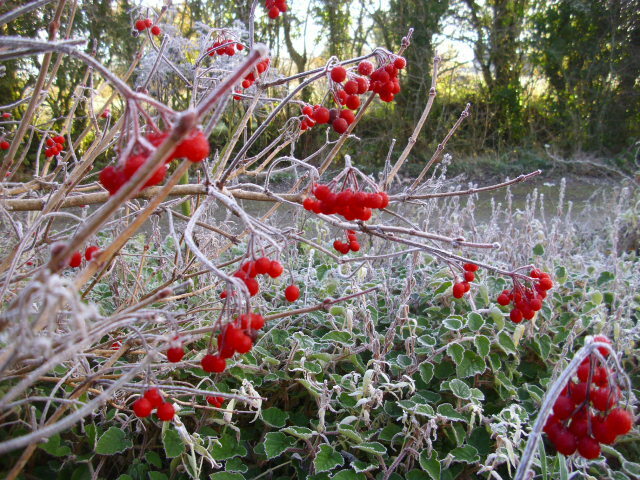 Frosted baubles on the Guelder Rose. Temporary exhibition…soon to be melted away by the rising Sun. 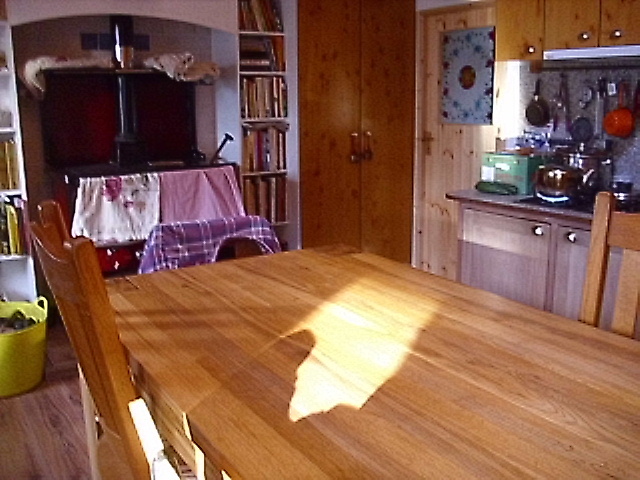 The Sun is getting lower in the sky now casting shadows deeper into the cottage. 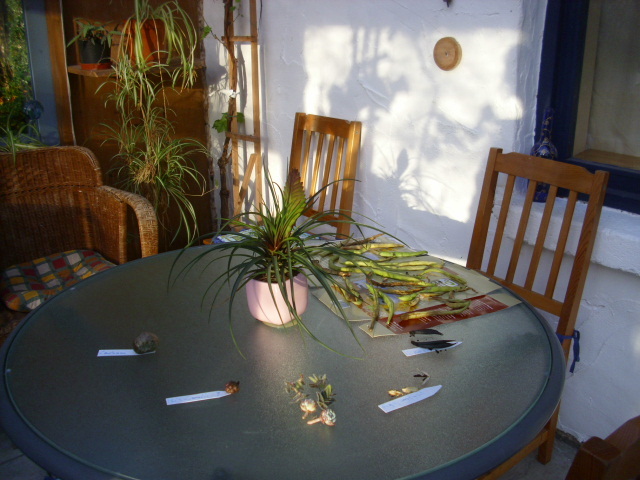 So nice to be greeted by early morning sunshine on the table. Strange shadow play on the conservatory wall. Seeds for next year drying on the table. 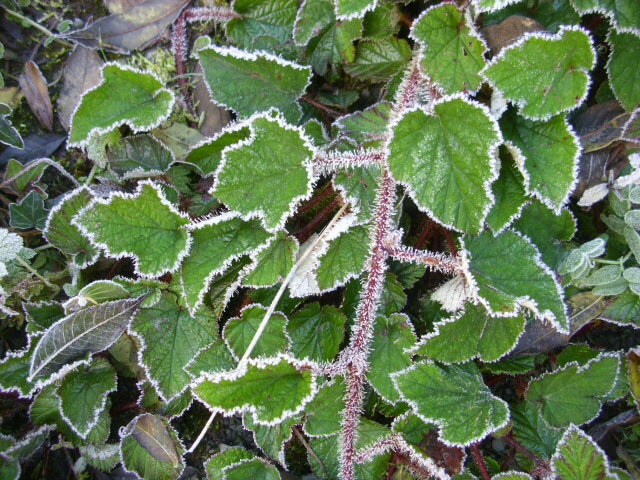 Gardeners are always thinking ahead to the next season. Still a bit misty outside. Out into the garden. 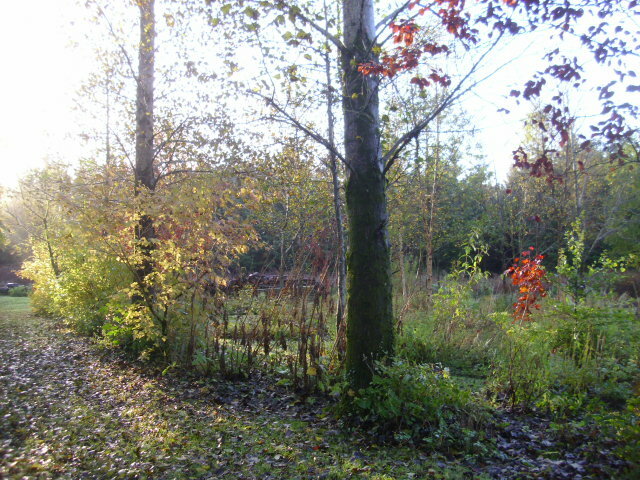 The Sun is at the south east but shortly the whole garden will light up as the Sun comes round to the south. 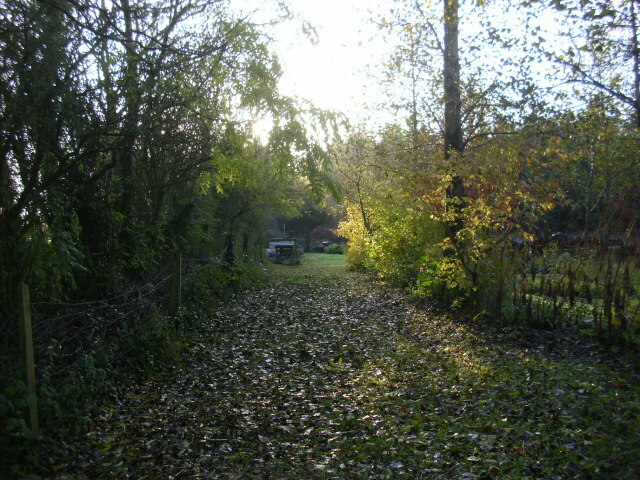 Still lots of leaves to be collected. Such a stunningly beautiful morning! More like Summer than November 1st. Been a while since I walked the garden in my dressing gown at this time of year. That’s the good thing about living in the sticks…no one peering over the hedge…ever! Back to the conservatory for more shadow play. By December 21st the Sun should be just skimming the top of the trees in the forest behind us and casting shadow and light even deeper into the cottage. 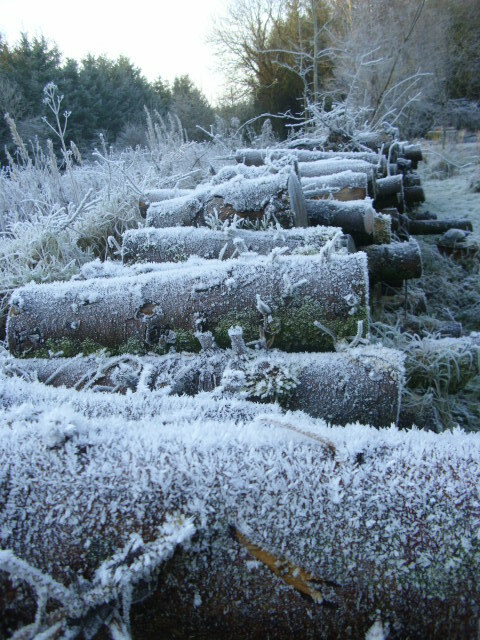 As this is our first Winter here we are seeing all this for the first time. 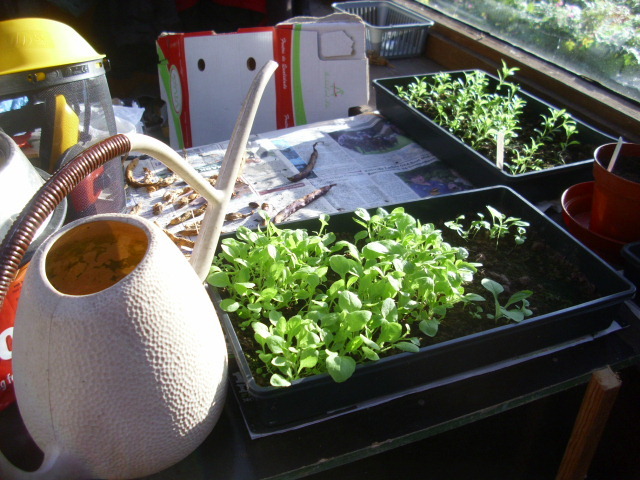 Seeds to be potted on are highlighted too. 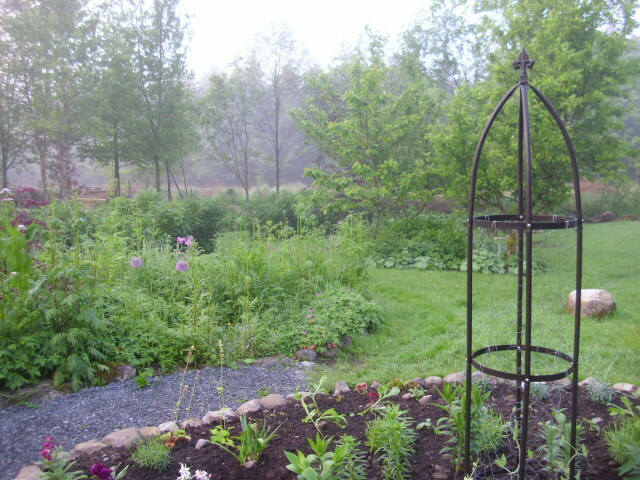 Canterbury Bells and Dianthus planted in the Autumn to give a head start next year. while Freddie is needing some TLC. 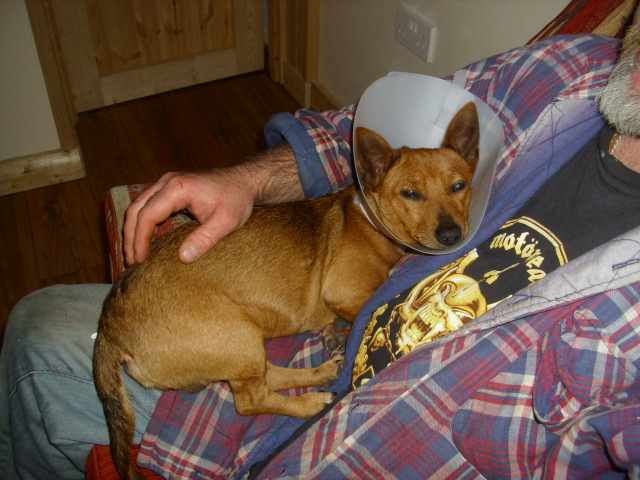 He had his little op a few days ago and has to wear this silly lampshade so he doesn’t go near his stitches. 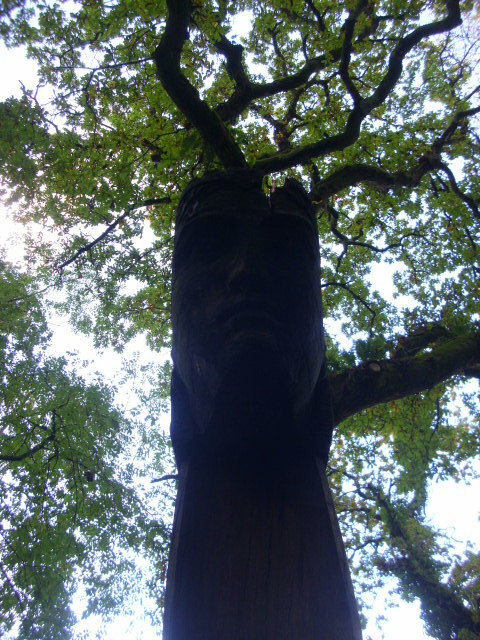 Be careful if you go down to the woods today…especially approaching dusk. It’s that time of the year when ghouls, goblins and other mischievous beings come out to scare and haunt and taunt. It’s dark and still and eerily silent in the woods on these days around the turning point of the Celtic year. For it is the time of the changing of the seasons. 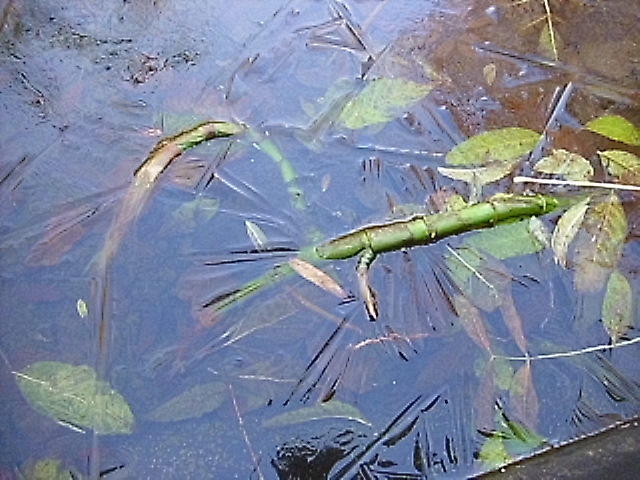 Summer is well and truly gone…Winter has come. 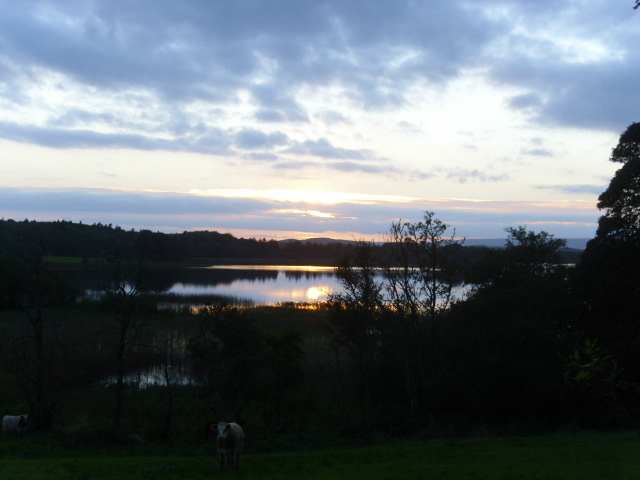 The Celts lives revolved around agriculture and the seasons. 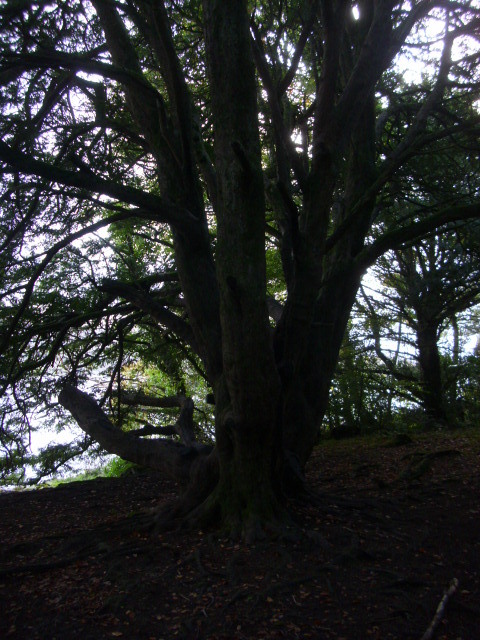 This time would be the end of the harvest…indeed all berries and tree fruits were picked before Samhain because the breath of the Puca and other evil beings would fall upon them. People dressed in masks and costumes to disguise themselves and frighten the evil spirits away. That’s where the tradition of dressing up at Halloween/Samhain comes from. As kids we dressed in old clothes at Halloween. The only thing bought new was a mask. Nowadays the shops are full of costumes for children and adults alike. High priced badly made tat from China. The masks have become so grotesque and horrible…blood and gore…the more the merrier. Despite the recession this stuff is flying out of the shops. Amazes me! For me it is a particularly poignant time of the year as it is the anniversary of my Father’s death. Twenty one years ago he left us at the age of fifty nine. I still miss him a lot. This year would have been his eightieth. I remember the funeral just before Halloween. While we were immersed in our grief and sadness everyone else was full of the joys of the season. Such is life! Enjoy the dark time of the year…for us sure as night follows day the Sun will return in the Spring…warming the land for another growing season. Enjoy the fruits that have been harvested this year. The goodness of the Summer to sustain and nourish us through the dark time. 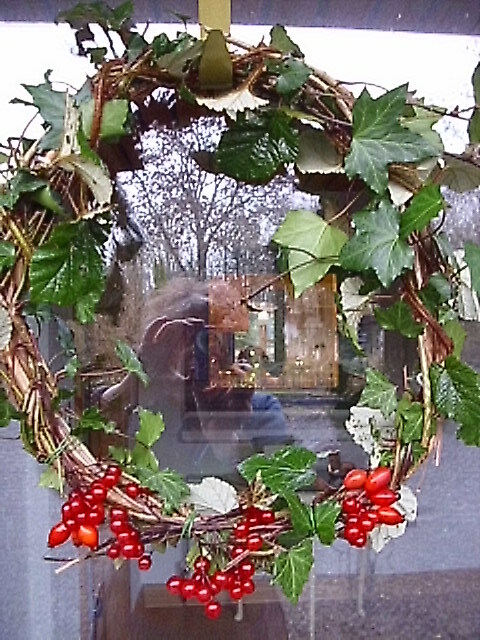 A time of reflection, reading, crafting…glowing fires and hearty soups. 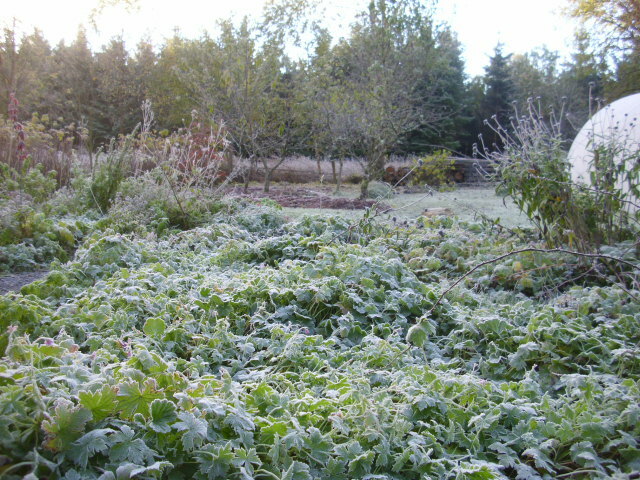 Will we have snow or will it be a mild wet Winter? The answer will be revealed in time. Enjoy the season that’s in it. Happy Samhain/Halloween to all who pass this way. 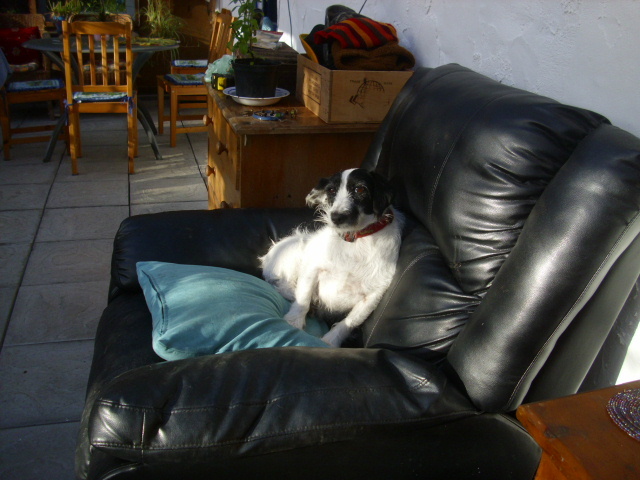 http://anirishalternative.blogspot.com aiming to be self-sufficient in Ireland. 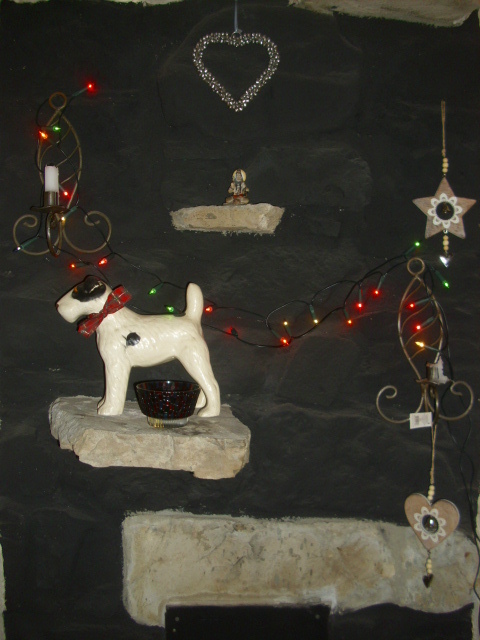 http://avillagepantry.wordpress.com lovely Irish foodie blog. http://bardsinthewoods.com poetry, walks and picnics in the woods. http://brownenvelopeseeds.com organic seeds grown in West Cork. http://celticways.com thatched cottage, labyrinth, bards and harps. 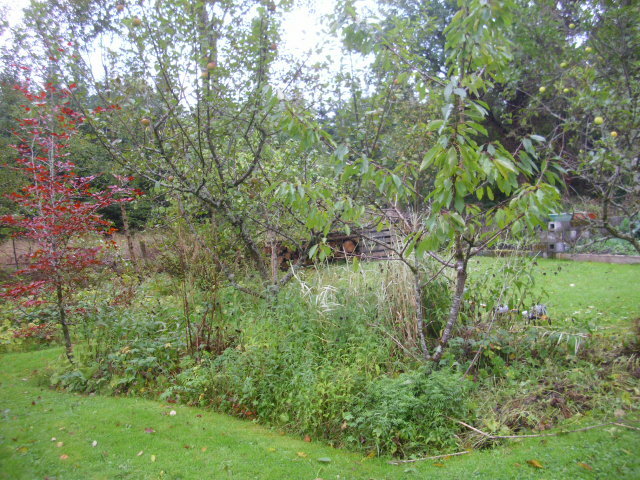 http://ecoenchantments.blogspot.com a slightly whimsical blog of the magical, pagan and faery kind. 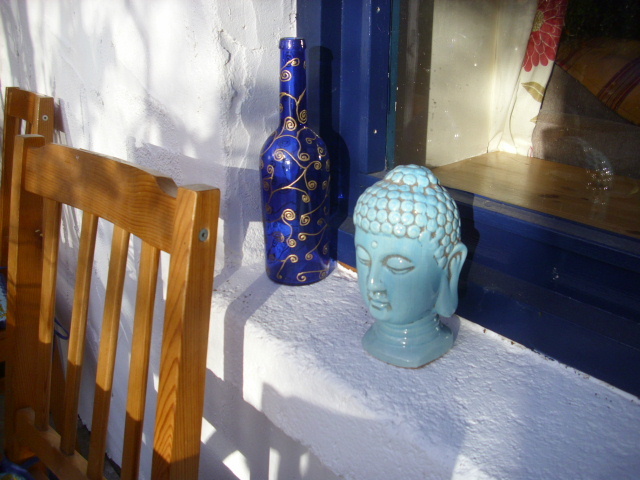 http://inspirationalhomes.ie Sustainable and distinctive homes and buildings in Leitrim. 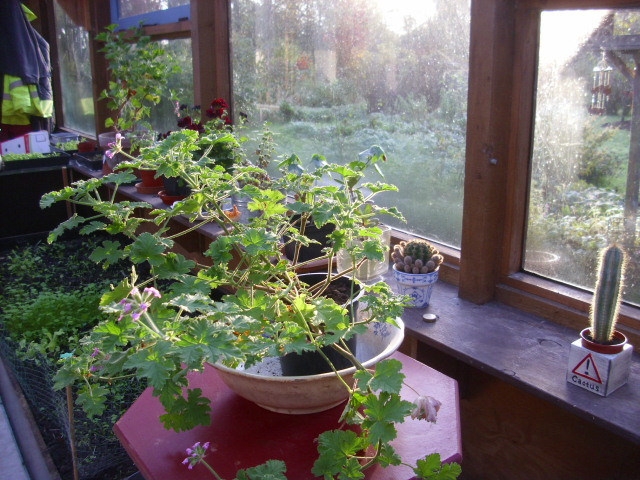 http://irishseedsavers.ie cherishing and preserving seeds. 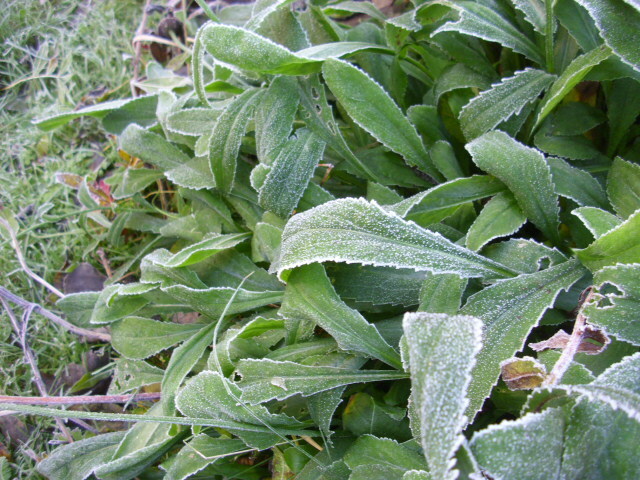 http://kitchenlifeskills.blogspot.ie wonderful Irish food/foraging blog by Sally Mc Kenna. 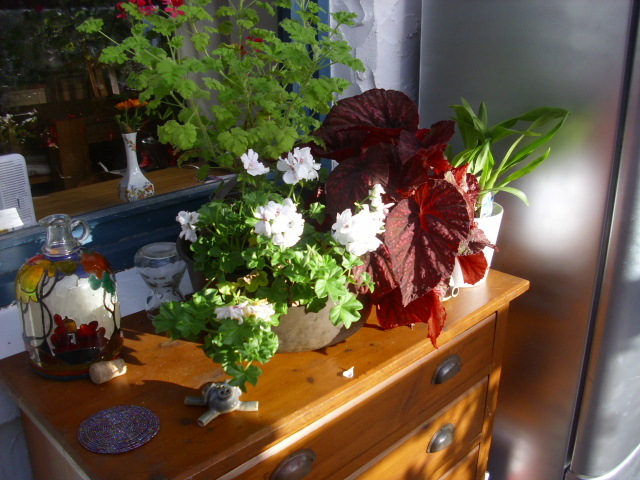 http://naturegirlireland.blogspot.com blog of Mary Reynolds, winner of gold medal at Chelsea. Nature gardener extraordinare. 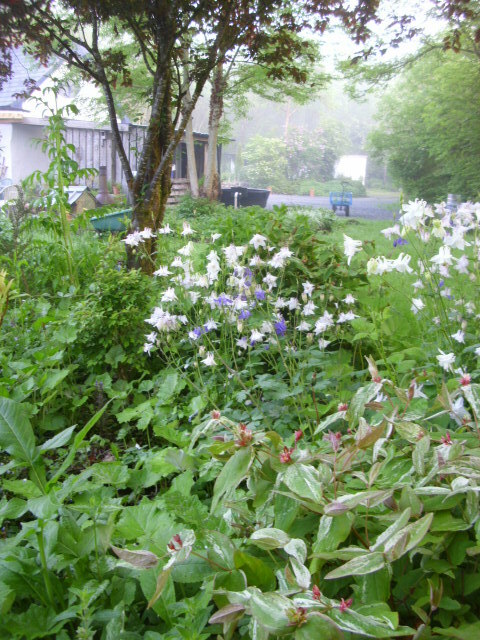 http://wellywoman.wordpress.com gardening blog from Wales…in wellies.